1. REDUCE YOUR FIRELOAD: Clear dead trees from your property, along with slash piles and brush piles. Cut tall grasses with a field trimmer, swather or livestock. Keep outbuildings and other structures free from debris and make sure they are accessible. Every summer my parents cut down trees that are "standing dead", as well as dead branches and over-grown brush. They are careful to position slash piles far away from any structures and only burn after a heavy rain. 2. "FIREPROOF" STRUCTURES: Although not many structures are truly fire-proof, there are a few things you can do to reduce the possibility of fire. My parents built their home and all of their outbuildings utilizing metal roofing as siding. Not only are their roofs metal, so are the exteriors of every building, including their home. Falling embers and floating ash will not likely spark fires on any of their structures. Not only did they use building materials that discouraged fire, they also built one truly fireproof structure - a "bat cave". They dug out the side of a hill, placed a 20 foot steel container in the hole and covered it with dirt, leaving only the door accessible. After they buried the container, they planted grass over the top and created an entry-way with huge boulders. All of their basic necessities, food, water and medicine, along with blankets, etc. are stored in the "bat cave". If everything else is lost, they have something to see them through. 3. FIREFIGHTING EQUIPMENT: In addition to other preparations, my parents have invested in equipment to fight fire. They have a large dozer that can cut a fire-line in a matter of minutes and also a fire fighting trailer (formerly used on a logging job site) equipped with a 350 gallon water tank, trash pump (the trash pump allows them to draft from the creeks, of which they have two on their property, allowing them to fill the tank without any pressurized water supply) water pump and fire hose. They keep the fire trailer accessible during the entire fire season, maintaining operational readiness by using the trailer to water their garden, thus ensuring well maintained motors and a familiarity of operation. 4. PRE-PACKED BUG-OUT BAGS/ACCESSIBLE DOCUMENTS: If all of the previously established fire prevention methods fail, my parents have bug-out bags at the ready, along with highly organized and accessible documents. Their passports, birth certificates and other documents are stored in an easy-to-access folder in their safe. There is no rummaging through drawers or sifting through piles in an attempt to locate important documents as a fire is bearing down on the house. They have incorporated a "grab and go" system that is necessary when all other options fail. There are no guarantees when preparing for natural disasters but there are steps that you can take to minimize your danger. Thoughtfully determine what specific natural disasters are most likely to affect you and make preparations accordingly. If you live in an area prone to tornados, prepare for tornados. If you have a high probability of earthquake, plan for an earthquake. If your greatest threat is wildfire, assess your situation and form a preparedness strategy. Being prepared is much more than stocking up on food and waiting for TEOTWAWKI. It is about assessing potential threats and taking steps to mitigate the damage. Remember - preparedness is not rocket science, it's just good, old-fashioned common sense. Warms my heart to hear about such practical preparation. It's easy to get side-tracked by the things we fear most instead of preparing for what is most likely. From my recent reading, your health should come first, followed by protection against transportation accidents. Obviously fire-prep is also on the list, but in different places for different areas. Anyway, thanks for the encouraging report. A couple years ago we had to be evacuated because of a wild fire about a mile from the house. My sister is a wildland fire fighter and gave me some tips that I shared on my blog that you might find useful. Amen Enola, being prepared isn't just stocking up food. You need to be prepared for anything!!!! I'm sending prayers for your parents, your family, and those families around you. Please remain safe!!! We haven't had to worry about wild fires this year so far. Our last major situation was in 2013 with the massive F5 tornado which went through Moore, Oklahoma. Your parents might want to get some Aqueous Fire Fighting Foam to add to their tank. It forms a thin, fire-resistant film on whatever you spray it on. http://www.chemguard.com/about-us/documents-library/foam-info/general.htm has a page worth of info on what it is, and how it works. A dear friend lives in a mostly rural area of California. Her home has a modest swimming pool that she affectionately calls her 'fire hydrant'. At first I thought she was kidding until she walked me into the nearby garage and showed me the two submersible pumps and related hoses. Unfortunately looting is the terrible reality that is facing the North Idaho fire area now and since people have begun to be evacuated. Total depravity of fallen man is quite evident. How hot does the ground get in a wildfire?How far down would such a container have to be? Would a buried container be the equivalent of a foil-wrapped potato in hot coals? It would be great for a tornado or something of that nature, but wouldn't it heat up in a fire? Wildfires are rare here, and generally small and quickly controlled. I remember reading a story in junior high about people cooking in bomb shelters below the streets of Dresden during World War 2-if I'm not mistaken, Dresden was a firestorm-the first one created by humans. I suppose a city burning down on top of something is different from a wildfire. I would imagine the oxygen was sucked out of those bomb shelters, as well. 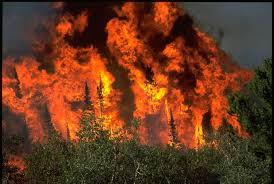 Wildfires burn fast and if it is just short grass, it will move on quickly and not get too hot. "Grab and Go" systems like your parents’ are an excellent way to pre-prioritize key items and save critical time. Just two of us normally live in our home. We have two '5-Min. Grab & Go' lists (hidden of course for OPSEC). The lists have no overlap in locations for efficiency. My wife grabs things at locations A and B. I grab things at locations C and D. This saves time by not having to decide what to take, its location or if it was already packed by the other. The lists include actions too, like reminding us to shut off the propane, move gas cans, etc. Incidentally, the first items are securing our pets. They will likely get anxious in the inevitable commotion. The last thing you want is to be ready to leave and not be able to find Miss Kitty.